You may or may not know that Facebook groups are a very popular marketing tool for many business owners and chances are you are a part of at least one. The benefit to a Facebook group is the community you can build and the attention you can give to the tribe you are building. Facebook is also more likely to show your members a post from your group than from your Facebook page and you can connect more often and more authentically with your audience in your group. There is one big piece of the puzzle missing here, though many might not even know it’s missing yet, and that is analytics. 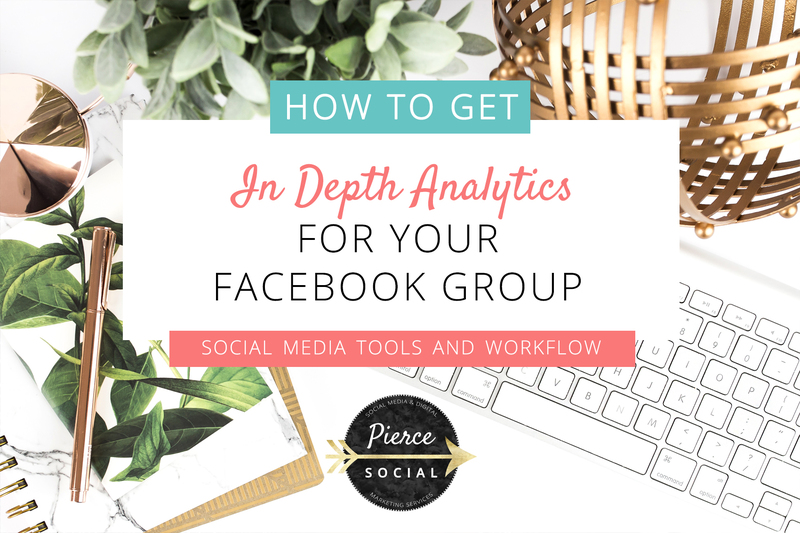 There is no data provided about your Facebook group as far as popular posts, active members, engagements or anything else. It’s a great tool but it would be even more helpful to be able to drill down into the data to learn more about your audience and what they respond to. I love that it shows me the posts that have gotten the most engagement. It breaks it down into posts with overall top engagement, most commented, and most reacted to. For me this helps me see which content people are most interested which is helpful when I am creating new products and services. You can even drill down to see which comments got the most likes, it’s pretty in depth! You can generate a collage of profile photos of your most engaged members. This is under the Engagement tools and is suggested as a way to generate some engagement. I love that it spotlights the Bosses in my group that spend the most time with me there! You can do walls of fame for general activity, top commenters, top reactions, top posters and more. There are other things under the Engagement Tools section, including a publishing tool. It lets you publish your wall of fame (or download it and do it yourself) and it gives you suggested posting times including activity by day and by hour. There might actually be too MUCH data bout you can do a lot, like drill down and get data on all of your members or just a specific one. As I mentioned before you can see ideal posting times and even export a list of members who are totally inactive. You can flip to your Active Member list and get a rating for each member based on their engagements. I found a lot of this data to be interesting but not exactly required to being successful within my group, but there were definitely some stats that were very helpful. Have you played with Grytics? I’d love to hear some of your favorite features! Be sure to grab your free Trello board and learn how to create a system around your social media management! Focus - Learn about the things you should pay attention to so you can get in and out with intention. Cut the Noise - How to filter through & reduce all of the noise on social media. Be Intentional - How to stop contributing to the noise and post content that gets results. Goal Setting - How to set goals that are in line with your business and big picture goals & how to track them. You're in! Now check your email and confirm you want to get focused on your social media marketing!